Englander Pellet Stove Bottom Auger Feed System Kit Including Auger Motor, Shaft, Bearings and More. ENGLANDER PELLET STOVE BOTTOM FEEDER KIT THIS IS A GENERIC AFTERMARKET KIT AND INCLUDES: 1 RPM AUGER MOTOR TURNS COUNTER CLOCKWISE PU-AF11B BOTTOM AUGER SHAFT AUGER BEARING & LOCKING COLLAR AUGER BEARING GASKETS Pellet Stove Auger Bearing (block bearing) for pellet units. 3/4 bore These new style auger bearings have a grease fitting, which will prolong the life of the bearing and your auger motor. The new style bearing can replace the old style that did not have a grease fitting. Englander Auger Motor PU-047040 This auger motor is designed to fit Englander pellet stoves including models 25-PDV and 25-PDVC (two per unit), and is the stirrer motor on Englander's 10-CPM multi-fuel stove. This auger motor is as powerful as it is quiet and provides a steady rotation that allows for an even distribution of fuel. Englander Stove Locking Collar 3/4 I.
Auger Shaft Locking Collar for pellet stoves. Price listed is for one piece (two pieces are on each stove, one per auger). The bearing gaskets come in two different styles: The fiberglass (soft, Part PUABG) type (which was primarily used on earlier model units, 2001 and older) and the nylon (hard, Part PUABGN) type (which is used on our current units, 2002 to present) Englander Bottom Auger Shaft Part PU-AF11B Englander Bottom Auger Shaft. For all Englander pellet stove models 2001 and later. SKU: BOTTOM FEED SYSTEM KIT. ENGLANDER PELLET STOVE BOTTOM FEEDER KIT. THIS IS A GENERIC AFTERMARKET KIT AND INCLUDES. 1 RPM AUGER MOTOR TURNS COUNTER CLOCKWISE. AUGER BEARING & LOCKING COLLAR. Pellet Stove Auger Bearing (block bearing) for pellet units. These new style auger bearings have a grease fitting, which will prolong the life of the bearing and your auger motor. This auger motor is designed to fit Englander pellet stoves including models 25-PDV and 25-PDVC (two per unit), and is the stirrer motor on Englander's 10-CPM multi-fuel stove. The bearing gaskets come in two different styles. Type (which was primarily used on earlier model units, 2001 and older) and the nylon hard. Type (which is used on our current units, 2002 to present). Englander Bottom Auger Shaft Part PU-AF11B. All pellet models 2001 and later. 2 Aluminum Flex Pipe For outside air venting only, 5FT. 3" x 6" Dura-Vent Pellet Vent Pro Straight Length Pipe. 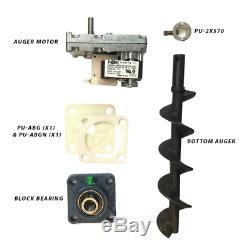 The item "Englander Pellet Stove Bottom Auger Feed System Kit Including Auger Motor, Shaft" is in sale since Monday, August 20, 2018. This item is in the category "Home & Garden\Home Improvement\Heating, Cooling & Air\Fireplaces & Stoves\Replacement Parts". The seller is "stove-parts-4-less" and is located in North Falmouth, Massachusetts. This item can be shipped to United States.